Caterham increases production | What Car? A surge in demand means more cars and extra staff for Caterham. 'Above-forecast' sales, both in the UK and internationally, means that production levels will be increased by around 10%. Caterham now expects to build 420 cars in 2009. Extra staff will also need to be recruited at the manufacturer's factory in Dartford, Kent. Caterham says that four new workers will be employed, on top of the existing 45-plus workforce. Caterham Cars managing director Ansar Ali said: 'When we saw the first signs of sales activity stalling last year, we cut our cloth accordingly. Crucially, in June, Caterham achieved more widespread European Community Small Series Type Approval for its models, which means that its cars can be sold in more countries. 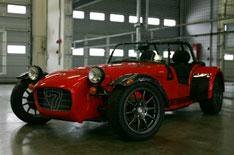 New Caterhams launched in 2009 have included the Roadsport 175 and Superlight R300 models.